Every home should have a piece in their home that creates drama and interest. 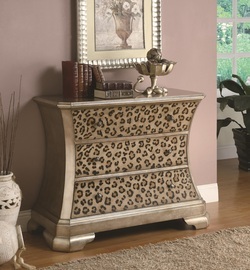 This accent cabinet will do just that with its diva-like leopard print on the three front drawers. Surrounding the sides, edges and top is a hand-painted gold that gives a modern, upscale vibe. With a arched side shape, gold finish and leopard print, this accent cabinet is sure to become an attractive piece in your entryway, living room, or bedroom.